We believe that there is a reciprocal relationship between the health of the land and the health of the people. We strive to provide meaningful experiential and educational activities for community to connect to the land, their health, and to each other. Hoʻoulu ʻĀina welcomes volunteers from keiki to kūpuna who may live in the Kalihi community or another part of the world. There are a host of opportunities for individuals and groups to engage in mālama ʻāina practices such as organic reforestation, gardening, and cultural sharing. Below is a list of regularly scheduled volunteer opportunities. These culturally-grounded, ʻāina-based activities are open to individuals and small groups (less than 8). There is no activity fee for attending these events. Please contact us for further information at 841-7504 or aina@kkv.net. 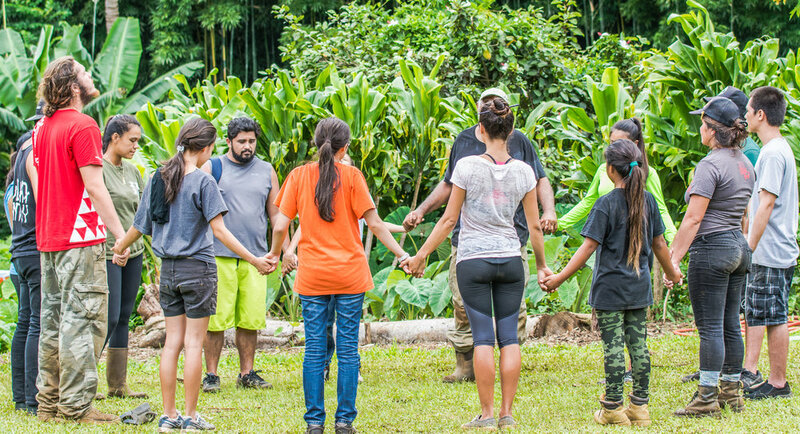 Every first Wednesday of the month, Hoʻoulu ʻĀina staff will offer a workshop that connects community to meaningful ʻāina-based activities and Hawaiian cultural practices. Lei making, ʻapu sanding, or shell lashing are just a few activities that bring community together to share in learning and laughter. A healthy ʻaipono lunch is served on this day. We invite volunteers to bring a healthy ʻaipono potluck dish to share with others. ***Aloha! Our Third Saturday community work days are cancelled. We are unable to accommodate a large volume of volunteers due to the ongoing structural maintenance required for the bridge, limiting access. We are hoping to start up again in 2019…mahalo for your understanding! Every third Saturday of the month, community volunteers work together to mālama the land. We offer various volunteer opportunities whether it is taking care of our organic garden, clearing invasive plants, or helping our Roots Cafe prepare a potluck lunch. We have volunteer opportunities that require all levels and abilities, and we welcome all ages from keiki to kūpuna. A healthy ʻaipono lunch is served on this day. We invite volunteers to bring a healthy potluck dish to share with others. Due to the great outpouring of interest from our community, we ask that groups of 10 or more pre-register with us at least one month in advance at aina@kkv.net. The last Thursday of every month, our garden crew will host a special topics workshop related to gardening from seed saving to fermented plant juice to banana growing. These sessions will engage community with in-depth information and hands-on application. All supplies are included and a potluck lunch will follow. A healthy ʻaipono lunch is served on this day. We invite volunteers to bring a healthy potluck dish to share with others. We spend Wednesday mornings in Pasifika where we learn from and with one another about Pacific Island traditions in agroforestry. Working together in the forest, we grow food and medicine in the traditions of our ancestors from Hawai'i to Chuuk, Japan to Ilocos Norte. Can you say 'banana' in five different languages? Thursday mornings we hold space for our community to see the connection between healthy food and healthy community. Our staff will engage volunteers in organic gardening, seed and plant sharing while working the land and holding meaningful conversations around food and food policies. Volunteers practice growing food on the ʻāina and then take their skills back to their home gardens. How do you make an u-paʻa lash? How is it used in hale building? These questions are answered in this workshop where community members will learn various types of knots and their function in hale building. This workshop is designed for volunteers who have some background in lashing and are committed to attending consecutive workshops.